Transparency Market Research has published a new report that offers an insightful study on the global industrial and commercial LED lighting market. The report, titled “Industrial And Commercial LED Lighting Market - Global Industry Size, Market Share, Trends, Analysis And Forecast, 2013 - 2019”, is available for sale on the company’s website. The report gives an accurate analysis of the strengths, weaknesses, opportunities, and threats in the global industrial and commercial LED lighting market. Furthermore, it also highlights multiple trends governing this market. According to the research report, the global industrial and commercial LED lighting market was worth US$12.9 bn in 2012 and is expected to reach US$86 bn by 2019, growing at a CAGR of 30.8% from 2013 to 2019.The global industrial and commercial LED lighting market is segmented on the basis of end user and geography. Industrial and commercial LED lighting is mainly used for industrial, commercial, architectural, and outdoor purposes. The commercial segment is further sub-segmented into office buildings, hotels and restaurants, retail shops, educational institutes, and warehouses and storage units. Geographically, the global industrial and commercial LED lighting market is segmented into Europe, North America, Asia Pacific, and Rest of the World. 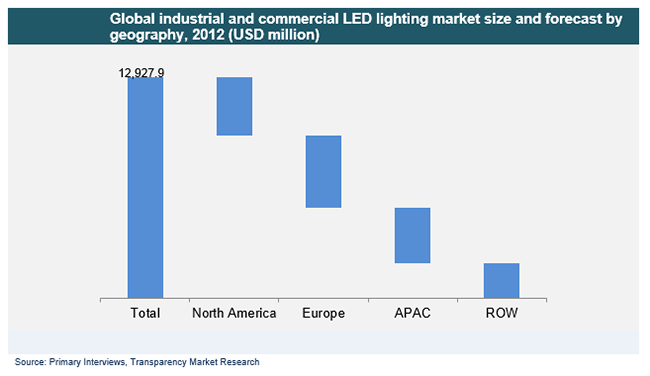 Europe holds the biggest market share in the global industrial and commercial LED lighting market. According to the research report, it held a market share of 33.1% in the global industrial and commercial LED lighting market in 2012. This impressive market performance is attributable to the increasing investment made by various governments in this region. The Europe industrials and commercial LED lighting market is also getting an impetus from the complete ban on the production or import of incandescent lamps. This move is forcing manufacturers to shift focus to LED lighting, thus benefiting the regional market for industrial and commercial LED lighting. In addition to this, countries such as the U.K., Germany, Denmark, and Russia are also trying out various methods of effective and efficient lighting. The search for improved lighting solutions will fuel the global industrial and commercial LED lighting market.Amongst the end users of LED lighting, the commercial segment held a market share of 52.5% in 2012. The key growth driver for the global industrial and commercial LED lighting market is the increasing awareness about reducing CO2 emissions and cutting down on energy consumption. The research report on the global industrial and commercial LED lighting market has profiled some of the key players in the market. The list of players studied in this report includes Cooper Industries plc, Digital Lumens, Inc., Osram Lict AG, Dialight plc, Koninklijke Philips Electronics N.V., Cree, Inc., Zumtobel AG, GE Lighting Solutions, and Toshiba Corporation. The profile includes an overview of these companies, their financial status, product portfolio, and research and development status.